There’s something to be said about the most popular of anything. 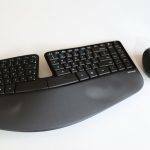 While the list below may not be my personal favorite or in any way the most appropriate ergonomic keyboard for you, as of this blog post (April 2018) they are the most popular ergonomic keyboards on the Internet’s largest retailer, Amazon. 1. Logitech Wireless Wave Combo. 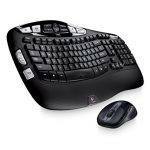 This combo comes with a wireless keyboard and wireless mouse that both share the same receiver. For typical users, the keyboard should last a couple of years on one set of batteries and the mouse three years. There are over 5,000 customer reviews and over 500 answers to customer questions. We reviewed the Logitech Comfort Wave here. By the way, this keyboard is the 4th most popular on Amazon right now. The top three are also Logitech keyboards. 2. Logitech K350 Wireless Keyboard. Amazon lists all keyboards by popularity. We’re just pulling out the ergonomic models. This model is #15 on the list but only the second to be an ergonomic model. In other words, the list of the 15 most popular keyboards by sales has only two that are ergonomic. This model is pretty affordable at around $40 msrp (check latest price). Unlike the set above, it doesn’t come with a mouse but has a longer expected battery life of three years. This one also has about a fifth of the reviews and questions answered…still a TON of content to weave through if you want to read what actual customers think. As a side note, you can always sort reviews and comments by folks that actually bought the keyboard from Amazon (click on Reviews, then “See all verified purchase reviews”). Here are the verified reviews for this model. 3. 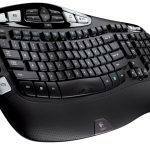 Microsoft Natural Ergonomic Keyboard 4000 for Business – Wired. Microsoft comes in third with the first wired keyboard in this list. Over the years I’ve moved back and forth from wireless to wired. Right now I’m using a wired as I don’t like occasional disconnects from the laptop or dying keyboard batteries which interrupted my work flow. Wired just works. We reviewed this model. Check it out! Here was our bottom line: Not everybody is ready to drop $270 for a Kinesis Advantage, or even $90 for a Freestyle Solo. The Microsoft Natural 4000, which was going for less than $35 on Amazon at the time of this writing, is one of the most affordable ergonomic options out there. If you’re struggling along with a “standard” keyboard, a properly-used 4000 can be a fine first step in the right direction. Check on the latest pricing. 4. Microsoft Sculpt Ergonomic Keyboard. Another Microsoft keyboard comes in #4. Both this model and the model above have well over 1,000 customer reviews and hundreds of answered questions. Too overwhelming? Just read our review on this model and as a bonus we also covered a Microsoft mouse! Our bottom line: The Sculpt Ergo will never be my top recommended keyboard, mainly because of its hard-action chiclet keys, pathetic function row, and lack of adjustability vs. the Goldtouch or Freestyle. Still, I am aware that many users adore chiclet keys, use the top-row functions only for media control, and are fine with an “average” working position. If this describes you, the Sculpt Ergo is worth considering. Among other pluses discussed here, this keyboard has the very convincing advantage of cost. 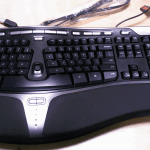 This is a good wireless ergonomic keyboard, keypad, and mouse combo that will set you back little more than most wired ergonomic keyboards – and far less than some. Check on the latest pricing. Why only four? Well we would have LOVED to have a longer list but Amazon only shows the top 100 things in a category. They combine both keyboards and mice into one most popular list and of the 100 most popular keyboards and mice, the above four are the only ergonomic models. The above list is a good starting point but hardly a definitive guide to ergonomic keyboards. You can’t go wrong with any of these if you are replacing a non-ergonomic model but if you are open to options, check out our comprehensive guide for more info on the wide range of ergonomic keyboards.